A wonderful sight on the SW horizon: the Moon slowly setting with a nice Earthshine and the top of trees eclipsing from time to time parts of our satellite. This was my view on the evening of November 12. 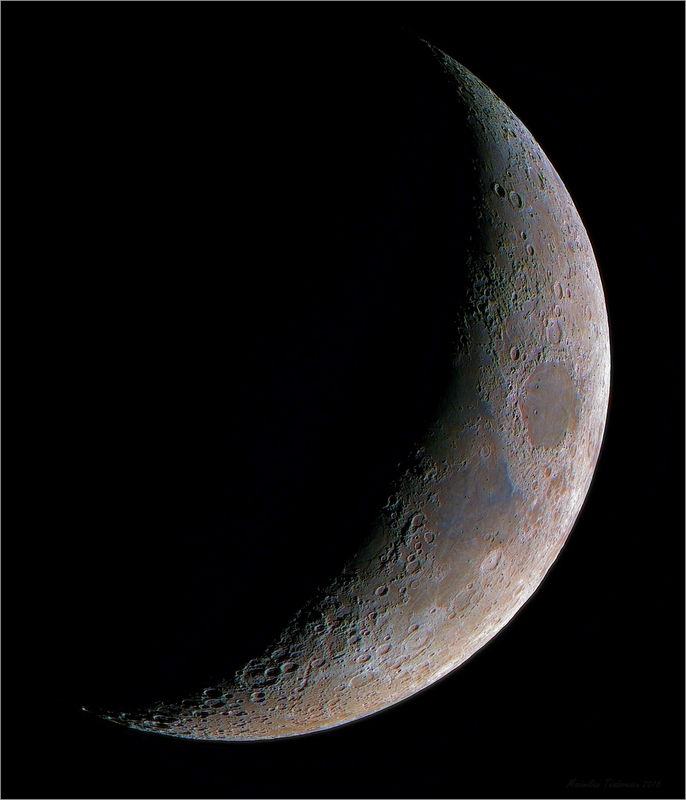 Did manage to get some shots, the first one being an RGB image processed in such way to show the very subtle colors of the Moon depicting minerals on the lunar surface. 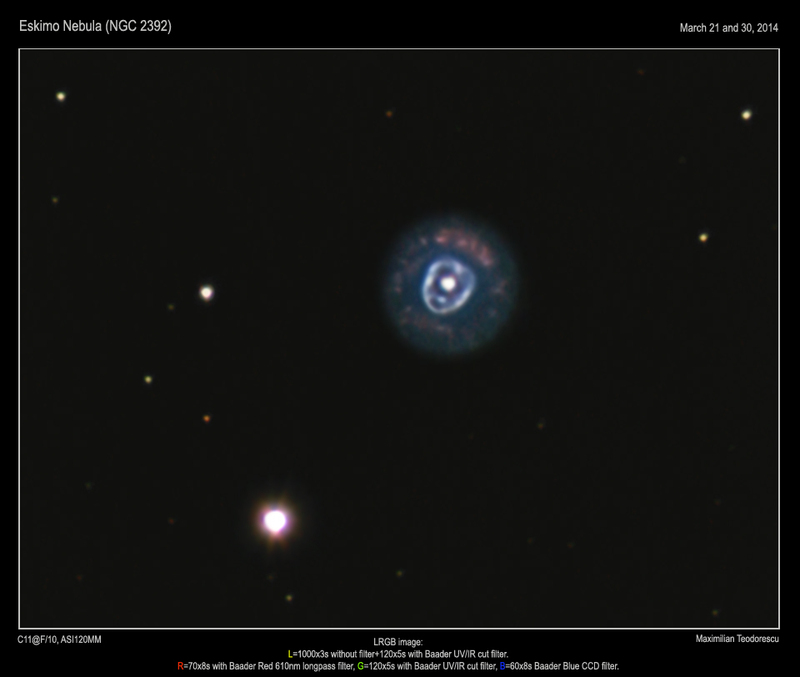 Equipment: 115mm F/7 APO Refractor, ASI 1600MM with RGB filters at the focal plane. 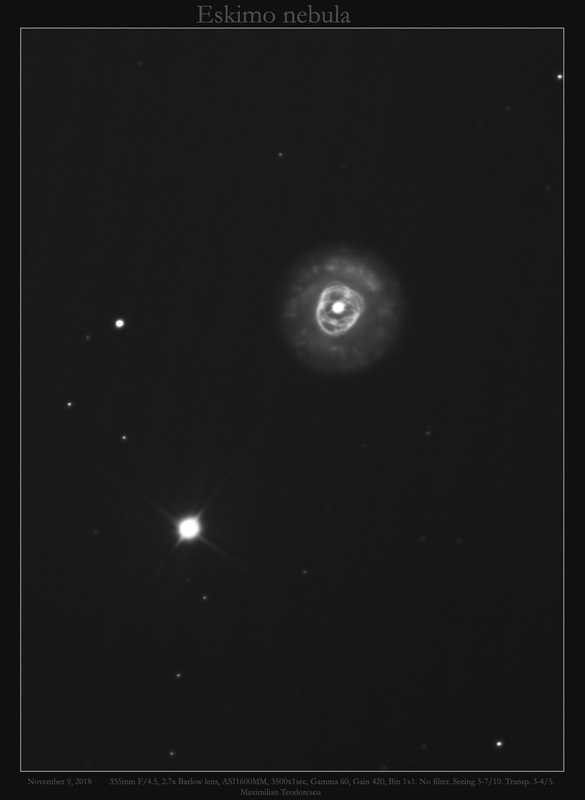 This is an image of the well known planetary nebula “Eskimo” in the constellation Gemini. 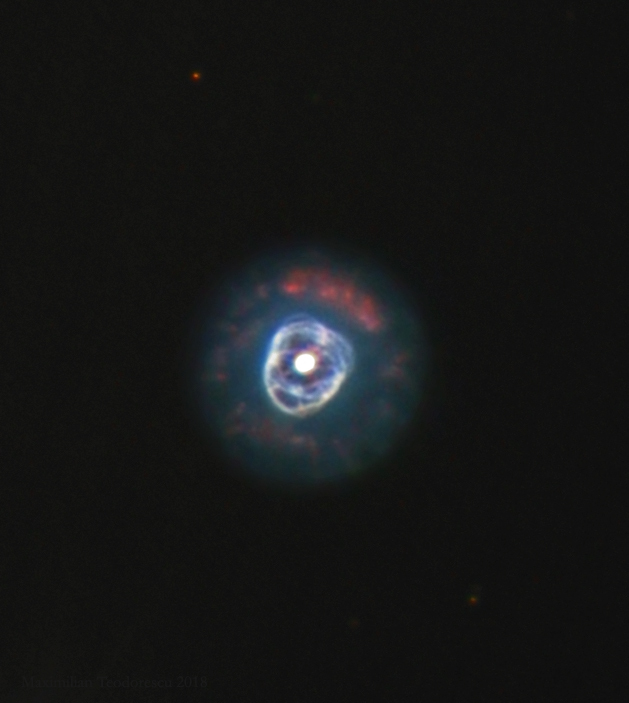 A well placed object in the winter sky, and a nice view in instruments above 100mm in diameter. My older shot of the Eskimo can be found here. 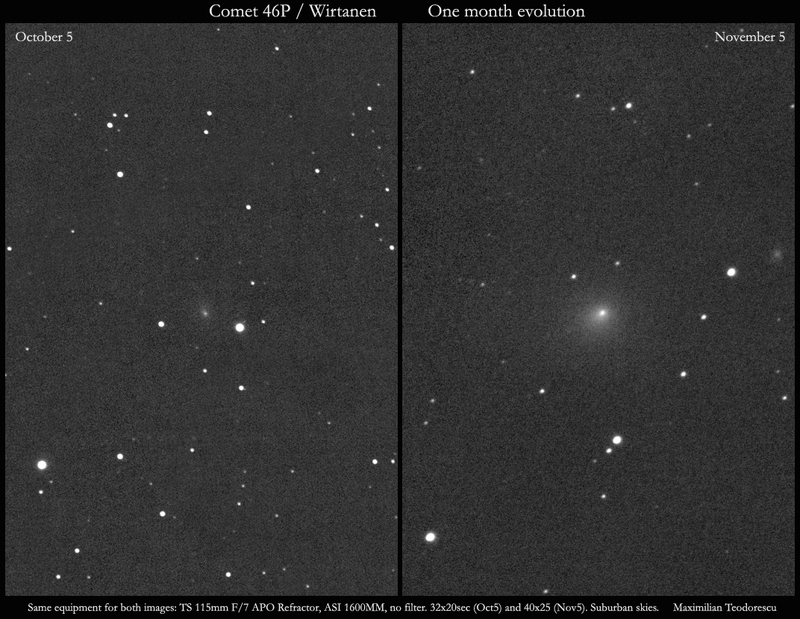 Using the same equipment under similar conditions, I can now compare the aspect of the comet and see just how much it changed in one month. After so much time without imaging our natural satellite, I’ve finally got a chance to “shoot for the Moon” once again. And what a chance: the seeing was good enough to allow the usage of a green filter instead of the regular red one. 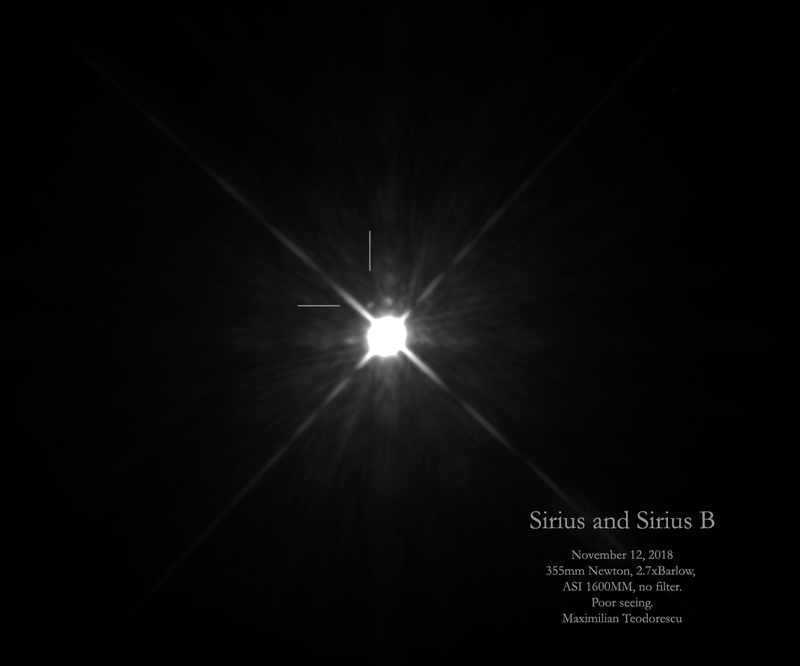 The image was not that stable (the Jetstream was in the 15-20 meters value), but for some of the imaged lunar regions I’ve surpassed my own previous resolution values. 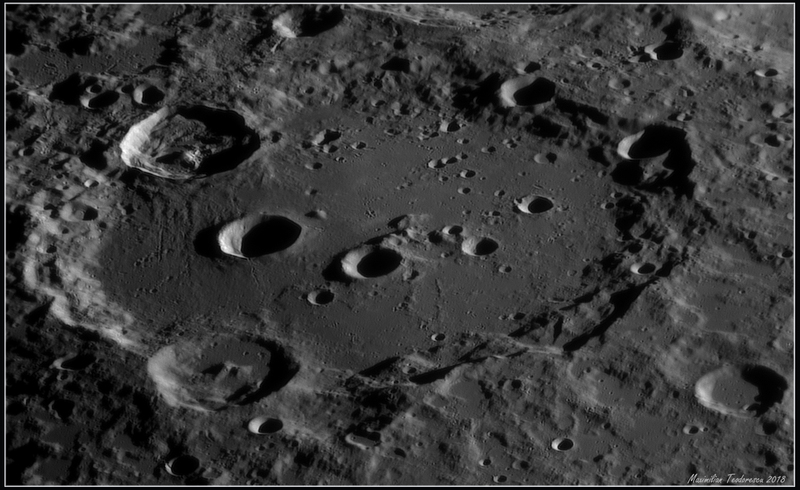 First shot is an originally sized image of Clavius, with a not so strong processing workflow. 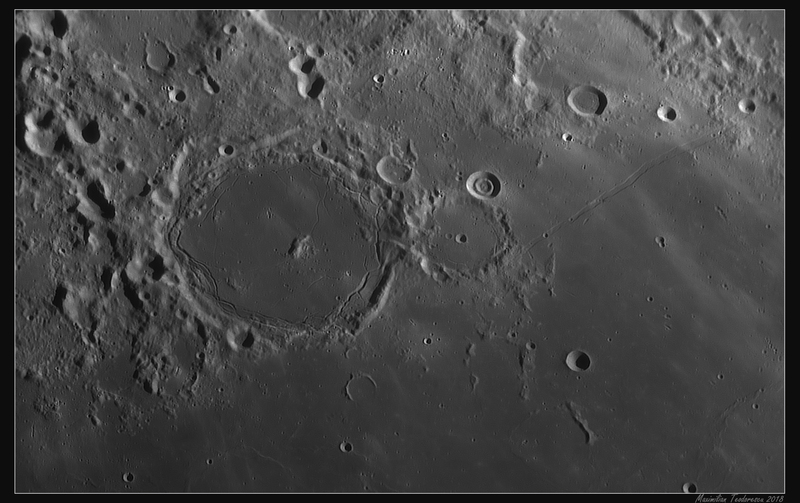 The image is my personal best of this feature, with small craters of just 600 meters (due to the high latitude of Clavius on the Moon, the actual resolution on its floor cannot be the same with the one in, let’s say, Ptolemaeus which is closer to the lunar equator, and this is due to the angle at which Clavius is imaged). 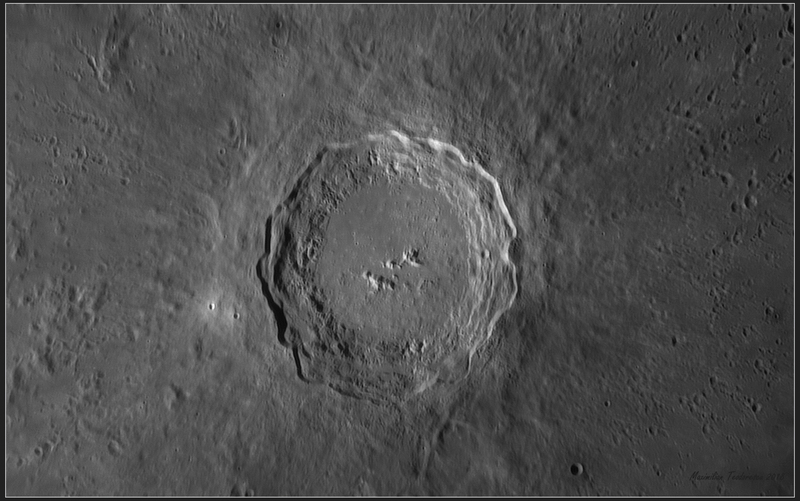 Another new personal best: crater Tycho with some very very very small “hills” on its floor, something that was sunk in the image noise in my older shots of the area. The large crater Pitatus with its highly fractured floor, and the double crater (or “crater in crater” looking) Hesiodus A. 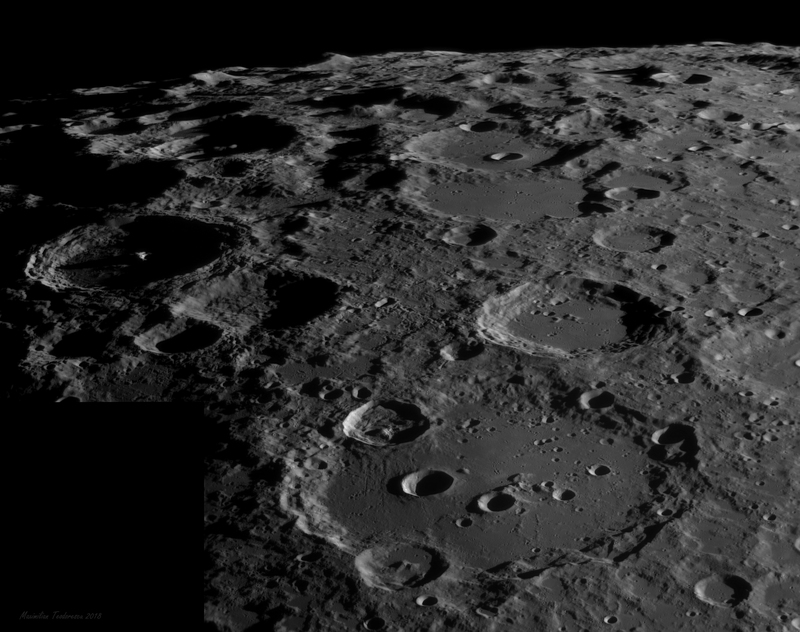 Smallest craters are around 520 meters in this image. 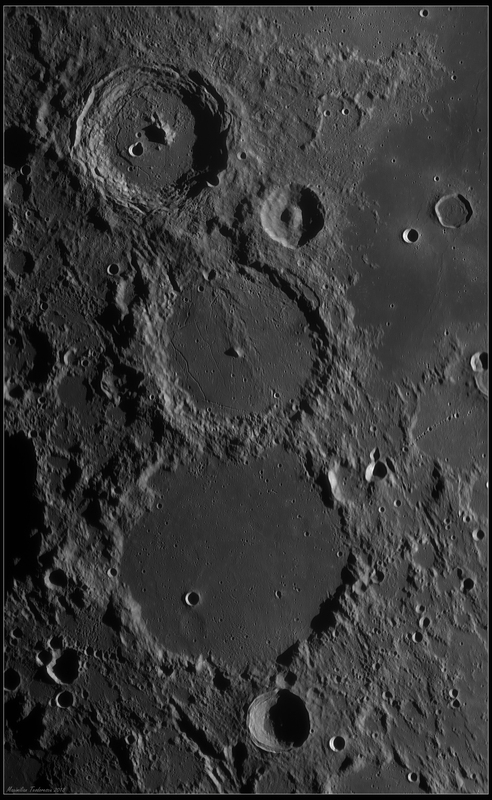 The large flat floor crater Archimedes, and the sinuous Rima Hadley. Smallest detectable craters are around 530 meters wide. 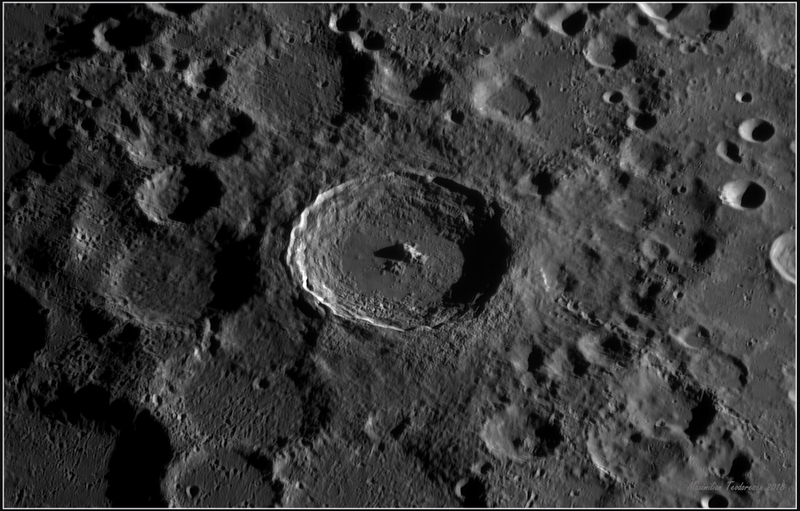 The South Pole with Clavius dominating the view, but also with Moretus in the shadows. Nice perspective of the mountains near the limb. One of my favorite areas on the Moon: the Triesnecker crater with the nearby complex rille system, and the Hyginus rille, mostly in the shadows. 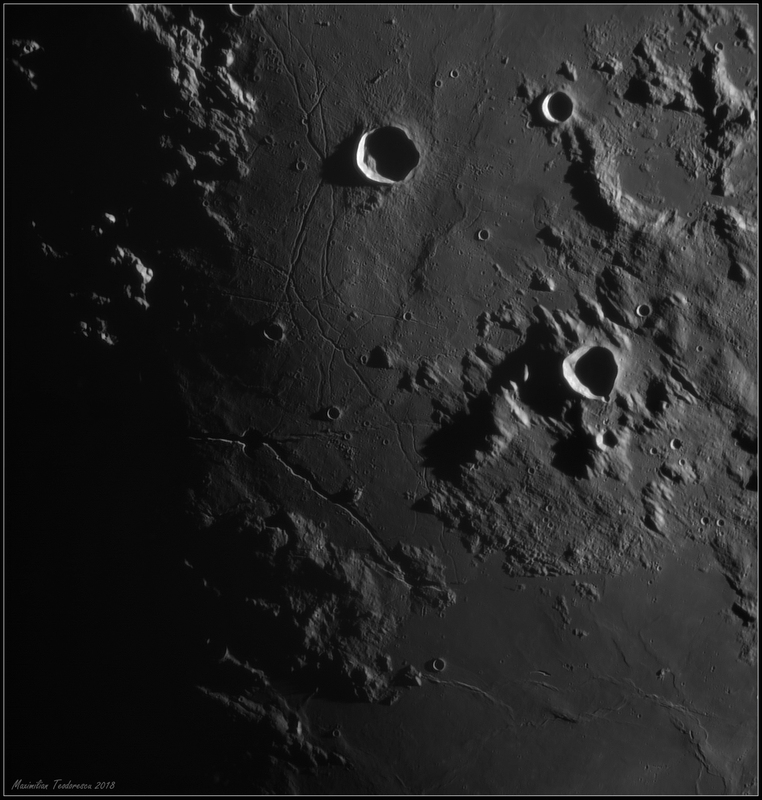 The well known trio of craters Arzachel, Alphonsus and Ptolemaeus. Each of these craters shows a different evolution, and each of them has some very interesting details on their floors. Arzachel has some nice rilles, as does Alphonsus. 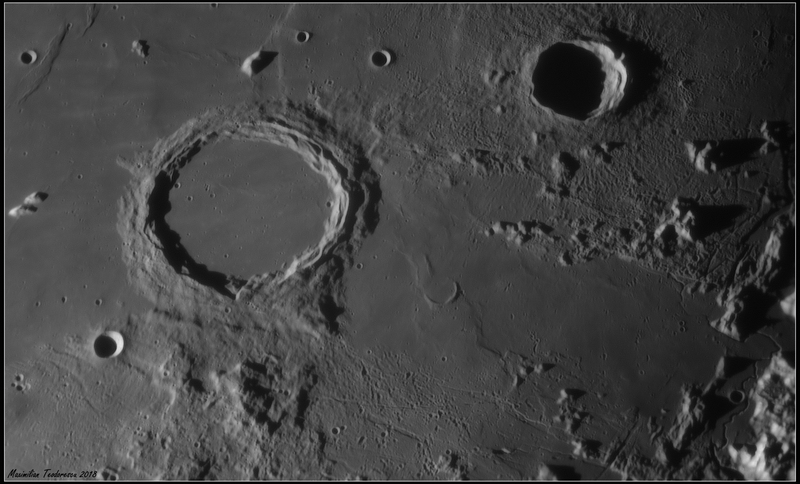 Ptolemaeus on the other hand has a lot of small craters that are useful for measuring the actual resolution on images. In this case, the smallest craters are about 450 meters (while some detectable rilles are smaller). 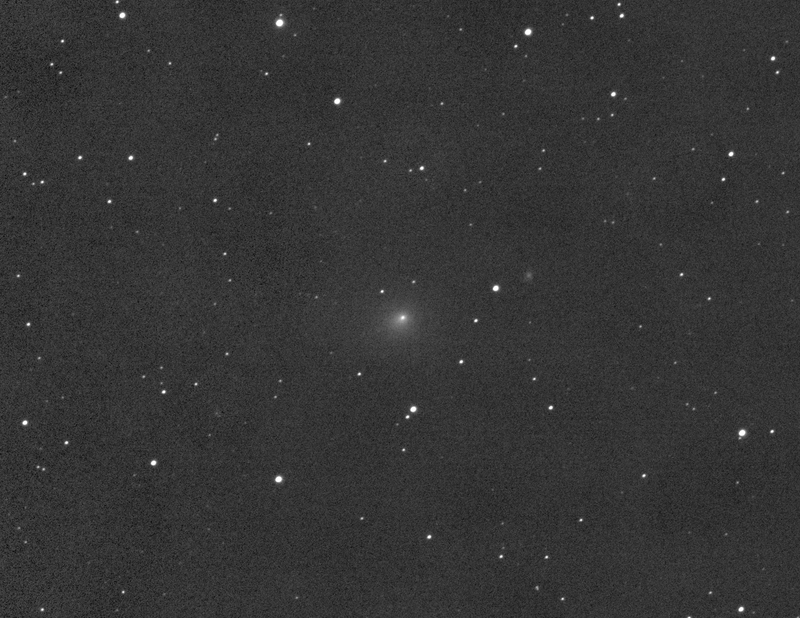 Unfortunately the seeing was rather variable during the acquisition, so the middle frame (this is a 3 image mosaic) showing Alphonsus is suffering from a slightly lower resolution. The large flat floor crater Plato and the distinct Vallis Alpes dominate the Northern area of the Moon. The small craters on Plato’s floor are used by amateurs to determine the resolution of an image; in my case the seeing was not great at the time but still, some craters of about 600 meters are detectable. There are also a series of smaller rimae systems between Plato and Vallis Alpes, collectively named Rima Plato. I am not sure however that the smallest of them, a two or three-way system at middle-point between Plato and the “mouth” of Vallis Alpes, should also be called Rima Plato; this feature seems more related to Vallis Alpes.